If one’s home is truly one’s castle, then Leigh J. McCloskey has created a portal into another dimension in his Malibu house. 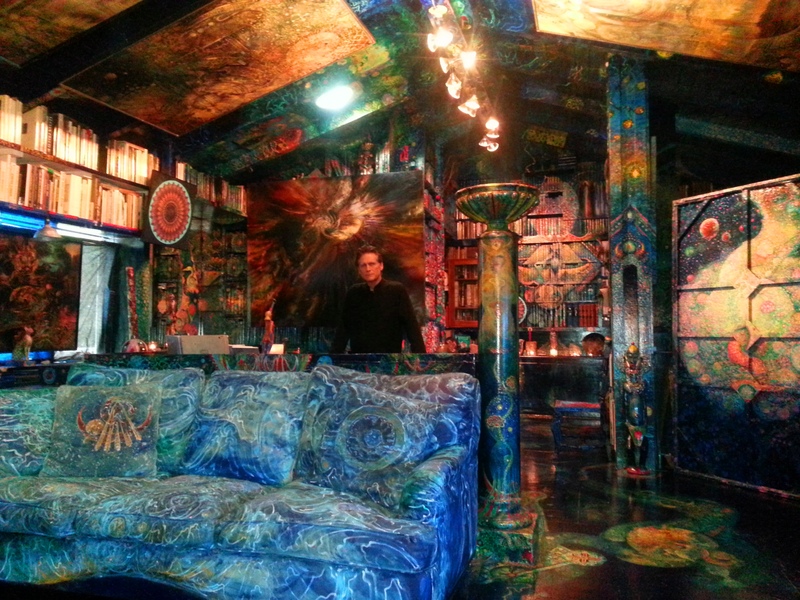 His upstairs “living” library is an acrylic painted road map into the psyche, with vivid, colorful archetypal symbols that leave each visitor enthralled. I just had to come back for more of his enchantment, and I did. McCloskey, an artist, actor, author, and philosopher, might well be remembered for his role as Mitch Cooper on the hit TV series Dallas. But acting was his day job—his real passion is and always has been his art. It all started for him on September 11 when the World Trade Center Towers came down and our concept of reality was forever changed. “I tried to make sense out of it all,” Leigh explains. “The only way I could search for answers and find true meaning, was through painting.” What transpired for him was a look into the journey of the human soul. Man most often searches for life’s answers when he is confronted with his own mortality. But for Leigh, he found that by examining man’s history he could get a glimpse into his future. He explains his symbolic art like an ancient philosopher. And like a wise sage, his students hear a lecture that, ultimately, will prompt their own self-examination. 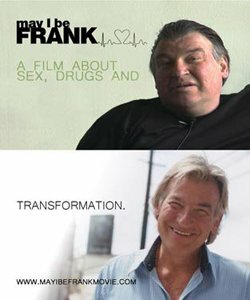 He is a brilliant narrator and it’s no coincidence he had a long and profitable acting career. 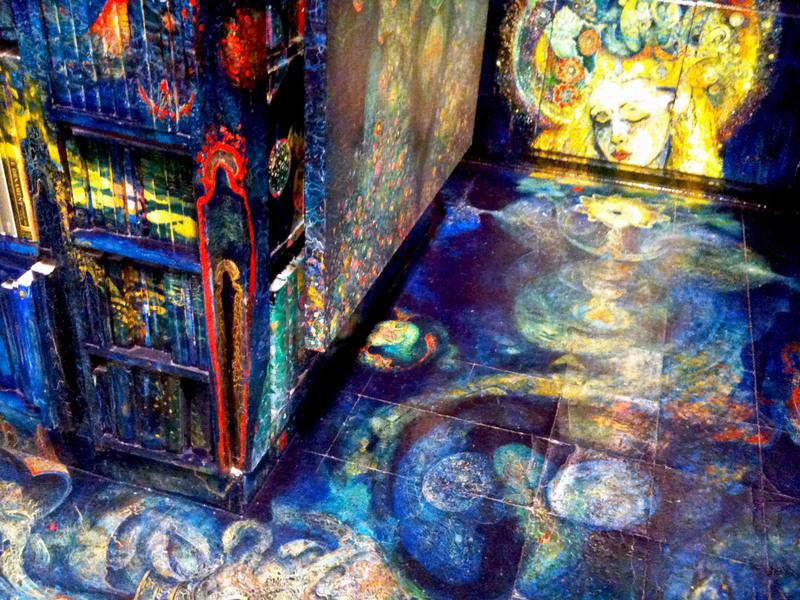 Every inch of ceiling, floors, walls, and bookshelves are alive with his murals and paintings. Even his sofa cushions are made out of canvas and display his creative mind at work. Flip over the cushions, and they tell a different narrative. Even what is hidden has underlying meaning. Everything in his library is a metaphorical visualization. What is truly amazing is that Leigh created his “Hieroglyph of the Human Soul” collection in 3-D, without even realizing what he had accomplished. When one dons 3-D glasses, and looks down at the floor paintings, one feels like they are looking below the ocean surface to the mysteries of the deep. And so much is hidden there, like life itself. 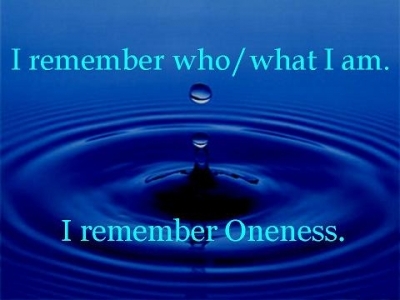 Throughout this experience, one feels an affinity with divine creation—a sense of oneness. Whenever I listen to Leigh, I see the ancient alchemist at work, weaving his magic into symbols that will forever awaken and transform us towards a deeper understanding. 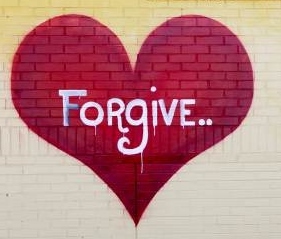 Forgiveness is something we can all practice on a daily basis. Perhaps its that person intentionally cutting ahead of you in the Starbuck’s line, or someone on their cellphone in a movie theater. While some might classify such occurrences in the realm of practicing tolerance, they are also opportunities for what I call “random acts of forgiveness”. It prepares us for when the bigger betrayals come in life that demand strength of character to either say you’re sorry, or that you were wrong, or declare peace and try to move forward from there. Sometimes such events can be somewhat lop-sided. One side may want to hold onto their anger for years—plotting revenge and perhaps even ways to destroy the other party. A scenario such as this usually has karmic undertones, and is really a joint agreement by both parties coming into this life to help each other learn to forgive and let go. But what if you’re willing to forgive and move on, but they’re not? I’ve experienced one of those scenarios. The kind that costs you time, frustration, and a lot of money as you deal with their need to win knowing quite clearly that no one ever comes out a clear winner in such cases. What if forgiveness is just not enough? In my case, I was given extra insight through a dream. In the dream I saw myself in a restaurant approaching a table where the other party was eating dinner with two strangers dressed in dark suits (probably lawyers). We were both surprised to see each other, and there was no animosity. I sat down and listened to her tell me about what she had accomplished in this lifetime so far and what she was still working on. We seemed to be just two friendly souls comparing progress notes. At one point, she sadly told me, “But my father still asks me: Are you pretty enough? Have you made enough money? Are you keeping your figure?” In her eyes, nothing she had accomplished meant anything because she still could not gain her father’s sought after approval. I felt a flooding of compassion and love for her. She was clearly hurting and dealing with soul issues of self-worth. I felt her pain and it was deep. I reached out my arms to her in the dream, embraced her, and said “I am so sorry”. My sorrow came from the deep realization that our altercation was just another parental-like dismissal for her, cementing her lack of self-worth. I suddenly had complete understanding of the situation and the parts we had both played. There is so much going on behind the scenes on so many different levels, and my higher guidance was showing me the true core issue. My dismissive actions had added to her feelings of worthlessness. I was sorry for my part and with it I experienced a deep release as I also forgave myself. I knew we had completed our work together and I was at peace. Cosmologists studying a map of the universe, from data gathered by the Planck spacecraft, have concluded that it shows anomalies that can only have been caused by the gravitational pull of other universes. These gravitational waves point to the existence of mult-universes existing in parallel conjunction with ours. First revealed by physicist Alan Guth in 1979, the presence of gravitational waves was confirmed by radio astronomers this year who stated that the foundation of the Big Bang supports Guth’s theory of “cosmic inflation”. Inflation theory predicts that ours is just one of countless universes to emerge from the same primordial vacuum. While we currently have no way of seeing these other universes, predictions of their existence have recently been corroborated by astrophysical measurements. They are out there. And it would be foolish to think we are all alone, or the only form of human life, in this great big multi-universe. Guth is presently the Victor Weisskopf Professor of Physics at the Massachusetts Institute of Technology and his findings would also support the concept that we do indeed live in a fractal universe as well. 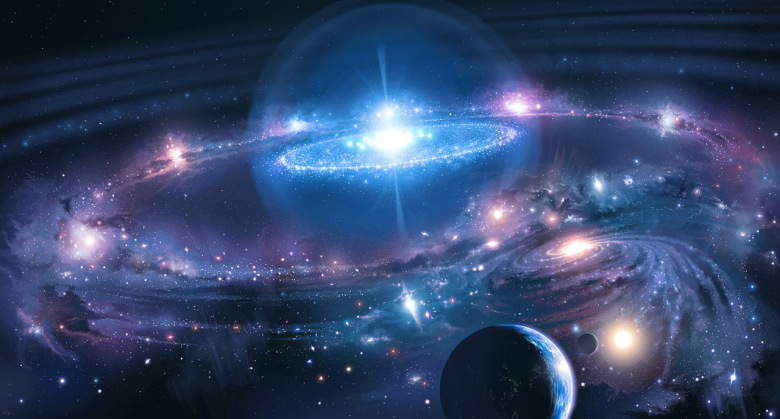 Universes within universes, holographic in nature, very much alike, but with only slight differences. It’s an expansive thought that gives you much to ponder. Does that mean there might be a parallel Earth, just like ours, in another universe? Or quite possibly each of us having a parallel life? If so, hopefully it is more peaceful Earth. An Earth which has learned to avoid wars, as well as killing its own for power. In other words, a more evolved Earth. About 25 years ago I had a somewhat unusual nitrous oxide experience while having a root canal done at my dentist. Under the influence of gas, I saw the human race existing, like billions of cells, inside a giant human body that made up our universe. We had no idea we were inside this large body but we were all working together to keep it alive and functioning as we accomplished our work. And this large body was a small organism inside an even larger body. It was a pretty trippy dental visit, but it gets you to thinking about collective consciousness and that there has to be some greater intelligence at work. 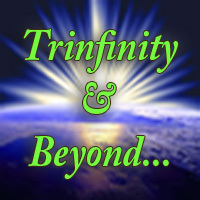 https://i0.wp.com/www.trinfinity8.com/wp-content/uploads/2014/06/utyu.jpg?fit=780%2C419&ssl=1 419 780 Kathy J. Forti https://www.trinfinity8.com/wp-content/uploads/2014/05/FINAL_trinfinityLOGOrevised-for-web-logo-300x174.png Kathy J. Forti2014-06-19 22:12:182014-09-19 02:19:57Are We Living in a Multi-Universe? Today is an auspicious day for me. My first blog post ever, which just so happens to fall on Friday the 13th. I admit that the pressure of keeping up with an ever evolving social media scene raises some fears in me. I wonder if I will be any good at this thing called “blogging” or, more importantly, will I have anything worthwhile to say which might inspire others? 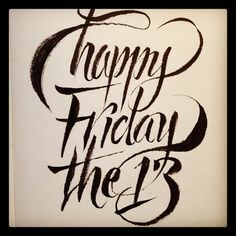 Years ago, while still practicing as a clinical psychologist, I had a client come in on Friday the 13th and wish me a happy “Triskaidekaphobia”. I had never heard the word before. They hadn’t covered this particular phobia in graduate school—“fear of the number 13”. So the irony of all this is that I am choosing to face my fear of writing this blog on the 13th. There are just no coincidences in life. Which got me to wondering why so many people universally avoid the number 13? Even buildings tend to eliminate the 13th floor on elevator banks and call it the 14th instead. Why are we so superstitious about this one simple number? Since numbers totally fascinated me after my near-death experience, I decided to look into the matter further. The number 13 is actually what the ancients refer to as a “Karmic” number. It symbolizes the forces of upheaval leading to revealing new ground. In other words, CHANGE. Change in general is a primary fear for every man. It encompasses the unknown. 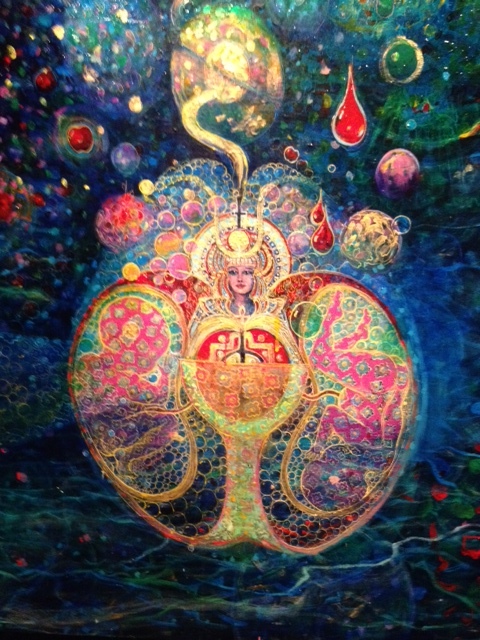 It puts us through tests and trials as we strive for greater spiritual consciousness.